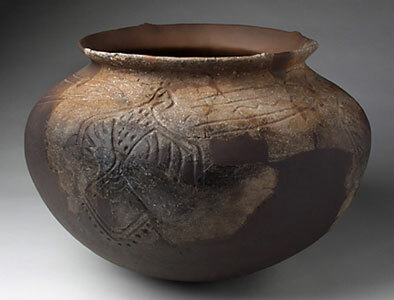 The object pictured above is affectionately known among archaeologists as the "Thunderbird Pot". More formally it is called the Link vessel, after the person who found it and donated it to the museum, Adolf Link. The vessel was discovered by Mr. Link at the Bryan site, a once-large village near Red Wing, Minnesota, that has been destroyed by gravel mining. Pottery is one of the most important sources of information available to archaeologists. Most prehistoric and historic potters throughout the world were women, and the skills for producing pottery were most often taught from mother to daughter. Of course, everybody in the family and village used the pottery for cooking and storage, so the pottery style comes to represent not only the makers, but the users as well. Thus, the choices of what clay to use, how to prepare it, and how to construct, decorate, and use the pot were the result of generations of experience and belief. Each example of a style is a miniature history of the people who produced it. By studying the material and technical aspects of pottery, archaeologists can discover information about the interrelationships among people and the environment in which they lived. The Link vessel is about 1,000 years old. It was made during a period archaeologists call the Silvernale phase, a time of intense interaction among many different cultures. The vessel was constructed by rolling prepared clay (called "paste") into strands (called "snakes"), and coiling the snakes to make walls. The potter then flattened and merged the coils by paddling the walls between a flat piece of wood in one hand and a flat rock in the other. After the walls were thinned in this way, the potter polished the walls by rubbing a smooth, flat rock along the outside surface (called "burnishing"). These were common techniques of the period. In most other ways, however, the Link vessel is quite uncommon. While most vessels of the period were approximately 30cm wide and 20cm tall, the Link vessel is much larger (36.5cm wide by 51cm high). The large size of the pot suggests that it was intended for use in a social gathering of many people. However, what is most striking about the vessel is the decoration. Along the top edge (called the "lip"), there are four series of arcs and points that probably represent the cardinal directions (North, South, East, and West). Much of the body of the vessel is covered with designs cut into the surface of the clay before firing (called "incising"). The designs fall into two categories. One design element is easy to recognize - it is a flying bird. This particular design, and especially the tail, is frequently seen on pottery of the period across much of eastern North America. It is called the Thunderbird motif, and it is generally interpreted to represent the sky, males, and warriors. The second design was once interpreted to represent bolts of lightning coming from the Thunderbird's mouth. However, a growing body of data suggests that the waving line in the center of the second design element represents water, and the outlines around it and the small point at the tip are the body and eye of the Water Spirit. In Native American religions, the Water Spirit most often represents the underworld, females, and fertility. By consuming food prepared in this vessel, people would have symbolically communed with and honored the spirits depicted on the vessel's exterior. It is extremely rare to see Thunderbirds and Water Spirits depicted either on the same vessel or so realistically. Yet these two elements of Indian ritual life are common to many cultures. Indeed, when the symbols on the Link vessel are understood as revealing beliefs about a division between the upperworld and the lowerworld, it becomes clear there are many commonalities among religions worldwide. Through studying ceramics, archaeologists can help build bridges not only between the past and the present, but also among the many different peoples who inhabit the earth today.